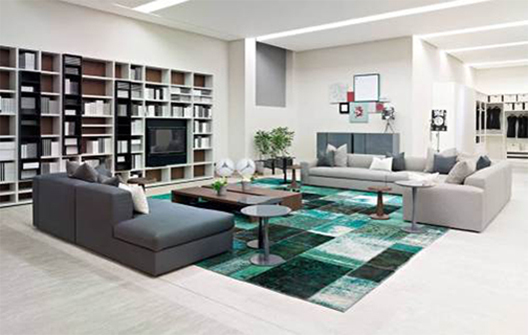 First Multi-line interiors showroom in Middle East offering internationally renowned brands is open in Saudi Arabia. Gallery Design, the first multi-brand showroom and retail space in the Middle East to provide modern and contemporary solutions in furniture, lighting, flooring and kitchens from internationally renowned interiors brands. The 4,500 square meter building, located in the Takhasusi district of Riyadh houses an edited selection of furniture from Minotti, Walter Knoll, Poliform, Poltrona Frau, Bulthaup, Porada, Donghia and Moroso and interior accessories and accents from Tai Ping, Foscarini and others. Many of these brands are debuting in the country and even the region for the very first time. Gallery Design addresses the changing tastes and lifestyles in the region – the desire to adapt to modern living, embrace international design standards and to mix contemporary furniture with classic pieces.